Setting up a bulk brewer can seem like a daunting task. So I’ve put together the basics so you can ensure you’re on the right lines, whether you’re bringing back out an old brewer for the cold winter or if you’re setting up a new one. It’s good to know how to set up the machine for a perfect cuppa every time. Bulk brewers come in lots of varieties, plumbed and unplumbed, you’ll need to ensure either way you have a good water supply. If your water is filtered you also give your coffee the best chance of reaching its optimum flavour. 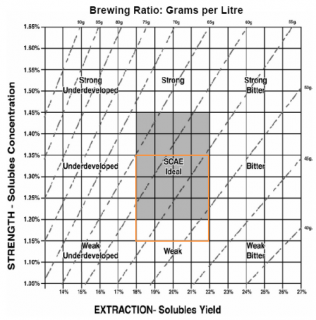 The trick to bulk brewers is figuring out the perfect brew ratio. By that, we mean the ratio of coffee to water that we are going to use. The brew ratio that we use for our bulk brewers is 1 part coffee to 55 parts water. This means that for every litre of coffee we brew we are going to need 55g’s of coffee. This brew ratio should give us an extraction between 18-22%. This extraction and brew ratio should allow us to get the best flavours out of our coffee without under or over extracting it. If you have one available and are super scientific, it is best practice to use a refractometer to check the extraction level. The refractometer will fire a light through the coffee sample and give you a total dissolved solids reading. More commonly referred to as TDS. Using this TDS reading and the SCAA brewing control chart we will need a reading between 1.20 and 1.35 to achieve an 18-22% extraction. For the setup on our Marco jet 6 bulk brewer, we are using our awesome Cafe Dolce filter roast coffee. Aiming for a 21%-22% extraction level on the coffee. This is achieved by programming the correct brew ratio, coffee pack size and the size of the brew on the machine. On the Marco brewer, this is fairly straightforward and done through a digital touchscreen. Other brands such as Bunn and Fetco have a similar programming menu but you will not be able to programme a brew ratio meaning you will have to work out the coffee doses and water yourself. For example if you are brewing a full 6lt batch of coffee at a brew ratio of 55g’s of coffee to a litre of water, then we will need a 330g of coffee. This ratio is a good place to start and if the coffee tastes too strong then you can put in less coffee per litre or if it is not strong enough then you can increase the amount of coffee per Litre. Different coffees will work best at slightly different recipes/ ratios. We have found that our café dolce blend works best at a slightly lower brew ratio of 50g’s of coffee per litre with a 21%-22% extraction. Some brewers will also have a bypass valve function that is used to brew larger amounts of coffee. This function allows some of the water to run down the side of the filter, meaning it will not come into contact with the coffee. This allows the barista to create a concentrate of coffee and then dilute it with the bypassed water. This process also allows you to brew bigger batches more quickly compared to running all the water through the coffee. I would recommend starting at a 20% bypass for brews over 5lts and then adjusting the percentage to taste. As well as a bypass valve most brewers will also have a Prewet/ Preinfusion option usually displayed as a percentage. This prewet function is used to wet and settle the bed of coffee thus helping prevent channeling and therefore increasing extraction. I would recommend a prewet percentage of between 12-15% on all brews. Again experiment with what percentage you feel gives you the flavours, body, and extraction that you are looking for. Hopefully, this will help give you a quick overview of how we approach setting up our new brewers and developing recipes for our coffees. If you want to learn more about all things brewing or just want to geek out on coffee, I would strongly recommend checking out Scott Rao’s book: The Professional Baristas Handbook. next post: Stop Neglecting Your Coffee Grinder!